Lurid, suggestive and explicit depictions of knives, for your gratification. Re: Lurid, suggestive and explicit depictions of knives, for your gratification. Yeah, I was gonna say. What was the other one you were trying out.........I forgot. Nice ones, Creek! LOVE that last one! One thing I've noticed for some time now on ebay is the old Grohmans selling for really decent money. And what is more interesting is the number of multiple bidders on each one. They have definitely caught the attention of buyers/collectors. I liken them to Norlund axes - huge demand and prices in the last 2 years. That's a monster! What is it exactly? Creek it's the crashete by Crashblade. Blade is about 14", OAL is 20". As good as it looks the ergonomics are even better. I swung this thing over an hour yesterday and not one hot spot or even a hint of one. Good for you, OE! I remember when Crash unveiled that beast for the first time, but I figured one of the Kracs had probably cabbaged on to it long ago. 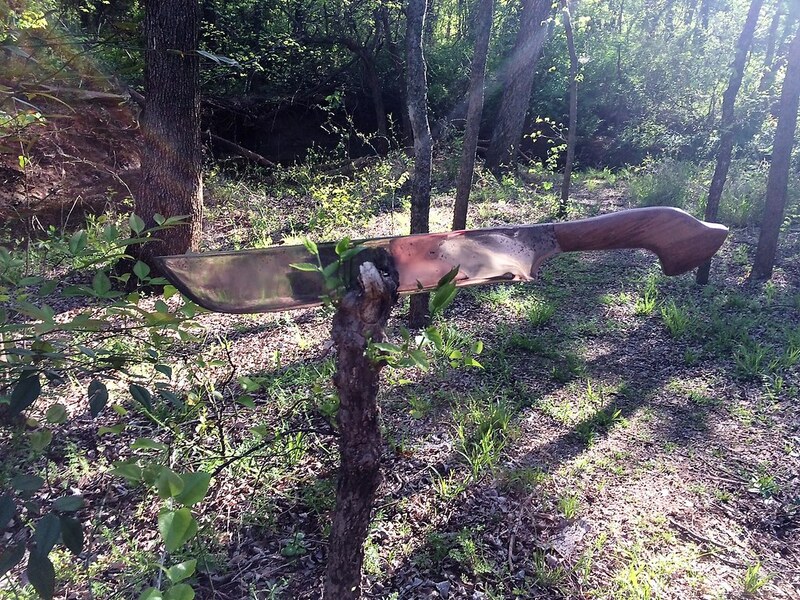 It looks like it would have been the perfect tool for clearing out a few acres of palmettos, beheading & sectioning 20' pythons or battling recalcitrant 'gators! Sweetness OE, that just looks like a lot of fun to take on an outing!! "If it's not broken, don't fix it"
I like the looks of that. Very nice work on both counts, Jeff. I especially like the ivory-looking handle on the second one......what specific material did you use? UhOh......what happened to the picture links? I deleted 'cause I'm not a custom (commercial) maker. I can post here? The second knife is a hippo tusk, water buffalo horn spacers, and some porous elk antler behind the guard. I made it for my dad years ago. I got it back when he passed. The first one is a blade from a Cold Steel Trailmaster, that I took off the rubber handle, and added some elk antler to. I didn't like the black sheath that it came with, so I painted the way you see it. It's more fitting for my black powder stuff for a sash knife.